In 1939, Ben Solowey (1900-1978) was asked about the influences upon his work. "Looking back to early days in art school call to mind a strong influence upon me of the French," said Solowey. "They through Delacroix, Courbet, the Impressionists and the Moderns, injected fresh air into painting." At the Pennsylvania Academy of the Fine Arts between the years of 1920 and 1924, Solowey found a near perfect mix of the modern and the classical in his education. During this formative period of his life, he was trained in the rigorous classical training that the Academy had been teaching since its founding as one of the oldest art schools in the country. Yet among his teachers were artists that were the vanguard of Philadelphias progressive society. Hugh Breckenridge and Henry McCarter, all of whom encouraged individual expression in their students. Arthur B. Carles, the citys modernist spokesman, also felt the same. They worked tirelessly to bring their students and the city into a modernist world through teaching, exhibitions, and various performances. 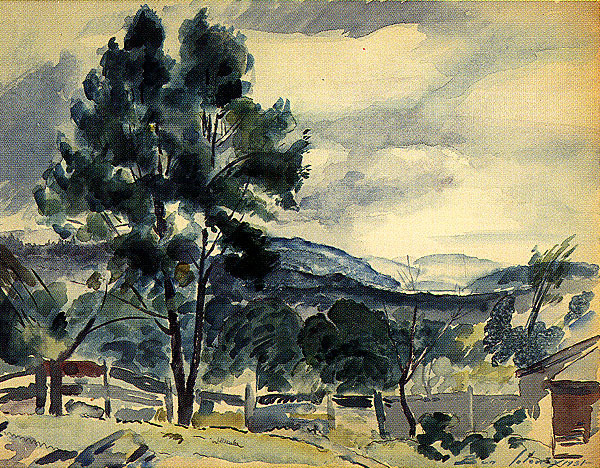 The trio, along with others, was responsible for mounting a number of influential Modernist exhibitions at the school during Soloweys time there, and the young artist was no doubt influenced by the exposure. Solowey solidified his interest in Modernism during a trip to Europe in 1924. There he spent months in Paris, the center of the art world, and soaked up the influences of the French painters he admired. Solowey returned to Philadelphia for a short period before moving to Manhattan in 1928, then the epicenter of American modernism. Solowey routinely exhibited his paintings in national and international exhibitions alongside those of Matisse, Picasso, de Kooning, and other legends at the Metropolitan Museum of Art, the Art Institute of Chicago, the National Academy of Design and the Philadelphia Museum of Art. FRESH AIR: Ben Soloweys Modernist Impulse was first organized by the Charles Demuth Foundation in August, 2000. The critically acclaimed show was expanded for this special installation in Soloweys own studio. Filled with imaginative still lifes, landscapes and portraits, this fresh take on Ben Solowey allowed visitors to see Ben in a new light. As art historian Leo Mazow writes in the shows catalogue, this exhibition "demonstrates the artists ability to synthesize a remarkable range of styles  modern and historical  and arrive at a sophisticated, individualized aesthetic." © 2002 The Ben Solowey Collection. All Rights Reserved.